DESCRIPTION: Wow! Where to start? I love this mask for a number of reasons. This is the first hydrogel mask I've tried (as opposed to cotton or fiber, which the average sheet mask is made of). This leads to a slightly slicker, slimier application, but I found moisture locked in much better and the mask also conformed comfortably to my face. It was also the first sheet mask I've done which came in two pieces, one for the upper half of the face and one of the lower half. I found this dual application also helped the mask conform tightly to my skin. The third "wow" factor of this mask was the pieces of real rose petals suspended in the gel. Those, together with rose essence, made for a lovely scented sheet mask. Now, all of these perks--the material, the two-piece application and the embedded rose petals--comes at a higher price than the average $1 sheet mask. These run about $4, so they're definitely not for every day use. You can see from the ingredient list that there are a lot of floral elements in addition to the rose. Cosmetic claims of rose ingredients range from "brightening" the skin to benefits for sensitive and particularly aged skin. Like most cosmetics, there seems to be little clinical evidence around the benefits of rose and floral elements on the skin, but the psychological effects of floral scents can be calming overall (I particularly find the rose scent relaxing and pleasant) and the cooling and moisturizing effect of the hydrogel pack calmed my reddened, sun-stressed skin. 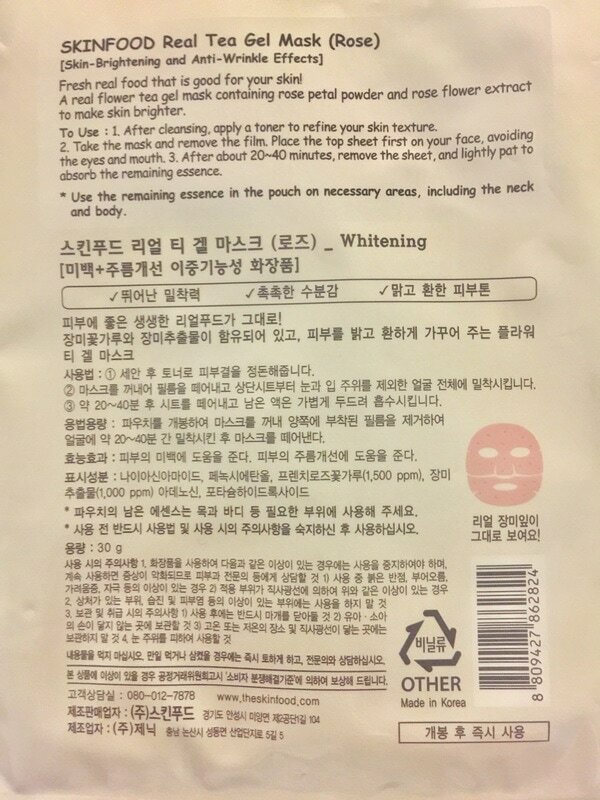 Application of the sheet mask is pretty standard: apply to clean, toned skin and leave on for 20-40 minutes. Gently pat in (or wipe off) the excess liquid. As with all sheet masks and products in general, discontinue use if you have signs of redness, swelling, itchiness and do not use on troubled areas. YAY OR NAY: Yay, for special occasions, given the cost. LINK: It's hard to find this one as a solo purchase, but Skinfood often offers variety packs here (this mask should run no more than $4 wherever you buy it). You may have seen lip tints making the rounds, not just in Korean cosmetics but also in brands all over the world. But what exactly are they and, more importantly, should you get one? What is a lip tint? Lip tints are all the rage in Korea and elsewhere in the cosmetics world. These are stains that can be comprised of many different ingredients and can be matte or shiny. But the main separation from a lip tint and say, a classic lipstick, is that lip tints tend to be far more subtle (read: natural-looking) and also give you the option of easy gradients or layering. Personally, I also like lip tints because they are easy to apply and smudge, making them fairly forgiving for an easy or sloppy execution. Lip tints can be applied several ways. For a gradient application, apply the lip tint in the center of the lips and blend outwards. For a darker or brighter look, apply several layers. For the matte versions, apply lip moisturizer beforehand. Lip stains literally stain the lips, with the color bleeding into your tissue. Those suckers stay on a long time, so make sure it's right before you leave the house! As I unfortunately learned one day trip, there will be no smudging and fixing later in the car. Some of the Korean brands last a full day or more, especially ones branded as lip ‘tattoos’. Lip stains are also much more pigmented and brighter than tints. This makes them harder to take off--both a blessing and curse, depending on your usage. Lip tints by contrast are sheer and easily smudge across the lips. They come off easily and are much more natural looking. ​Both lip tints and lip stains work differently than lipsticks: they absorb into the skin moreso than lipstick, which forms a layer on top of your lips, sometimes resulting in that cracked look. Lip tints come in a variety of formats: water, gel, cream and oil. Water lip tints are the most common and also the most subtle. They tend to be well, watery, and very minimal or natural looking, providing an easy pop of light color. Despite the texture, they are actually quite drying on lips so you will definitely want to apply some lip balm beforehand. Beware though—their staying power is fairly minimal so this is one you need to carry around with you. Others that go with a more “stain” texture can be a bit messy or drippy but absorb quickly into the lip. Make sure you test these out at the store first to see, as I’ve had the gamuntlet of water vs. dry tints. In terms of ingredients, I’ve noticed many lip tints tend to have more botanical or natural ingredients, which can be a big plus for a lot of consumers (and with a bonus of having a nice subtle scent). Read on for some of the Korean lip tints I’ve tried and enjoyed! Tony Moly's Get It Tint is really more of a stain, but provides a nice, not-too-bright lip color that lasts a long time. It's available in a variety of colors which you can order online, including: All Night Red, Red Chili, Coral Pink Ming, Play Orange and Peach Punch. Skinfood's Tomato Cool Jelly Tint (read full review here) is a gel-based tint but really I didn't notice much difference than a water tint. The application was slightly watery and very subtle, but created a nice natural color. Minimal staying power. Nature Republic's Botanical Magical Lip Tint is also incredibly subtle but I like the natural heightening of color it provides. 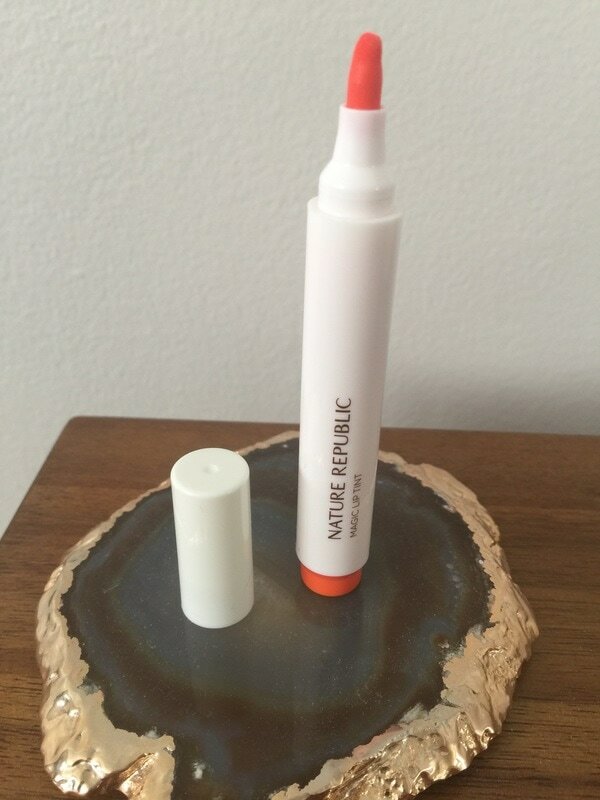 Also minimal staying power but it's marker-like application makes it easy to apply on the go. Have you come across any amazing lip tints? Feel free to share! 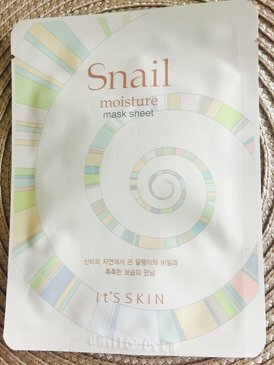 DESCRIPTION: Snail-based mask sheets are one of my favorite products, as snail slime an ingredient that results in skin healing. The ingredients don't list the amount of snail secretion filtrate but it is fairly high on the list, a good sign. YAY OR NAY: Yay, for being a high-quality mask. DESCRIPTION: This is a *very* subtle lip tint. Despite the bright orange color I selected, the tint is pretty neutral on the lip and definitely not vivid. The application is a sponge-like marker tip that is easy to apply, though I strongly recommend lip balm before or after as it feels a bit drying. The product box description is: "Marker-type tint for an easy and complete look, as if you're drawing with a pen." It is somewhat like using a dry felt-tip marker on your lips. The single application is comfortable and easy and generous with mistakes (no need to fill in the full lip as it blends easily), so it's good for a fast hint of color. Despite its subtlety, you can see from the ingredient analysis below that the product is chock full of fruit extract and royal jelly as an extra, probably leading to its fragrant scent. Overall, this lip product is good if you are looking for the bare minimum of color or going for an all-natural look. YAY OR NAY: ​Yay if you are looking for a subtle, botanical-based lip tint. DESCRIPTION: This is one of several in Innisfree's "Skin Clinic" line and the first I've tried. I was pleasantly surprised! The sheet mask is 100 percent cotton, resulting in a very fine and delicate texture (which is probably why it has a second backing sheet that needs to be removed). It's transparent and sticks very well onto the face, which the company claims allows for better absorption into the skin. The first thing I wanted to know is what the heck is madecassoside? I had never heard of this ingredient, but after a quick Internet search I found that madecassoside is a chemical ingredient from the edible Centella asiatica plant, found in various regions in Asia and used in traditional Indian and Chinese healing. Centella asiatica is also known as centella, Asiatic pennywort or Indian pennywort or Gotu kola. There is a lot of hype around this plant regarding its healing ability when consumed, but I could not find any peer-reviewed papers on the testing of this ingredient. Some websites claim that madecassoside has a soothing effect on skin and is particularly good for calming inflammation and reducing stretch marks. One website also claims that madecassoside can have a sedative effect in large doses and recommends caution when using it, but you'll see from the ingredient list below that madecassoside appears in the middle of the list so is probably not incredibly potent in this product. This mask was incredibly effective, leaving my skin smooth, cool and refreshed after about 10 minutes of use before bed. Overall, this mask is light and comfortable leaves the skin refreshed and soft the next morning. YAY OR NAY: Yay, for an excellent and affordable sheet mask in the Innisfree series. 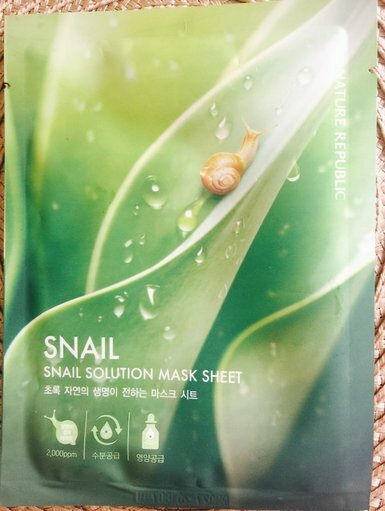 DESCRIPTION: This is hands down my all-time favorite snail sheet mask. I bought a pack of 20 on a whim in Seoul's airport with the intent to share some as gifts but found them hard to part with. I ended up keeping most myself--they are that good! 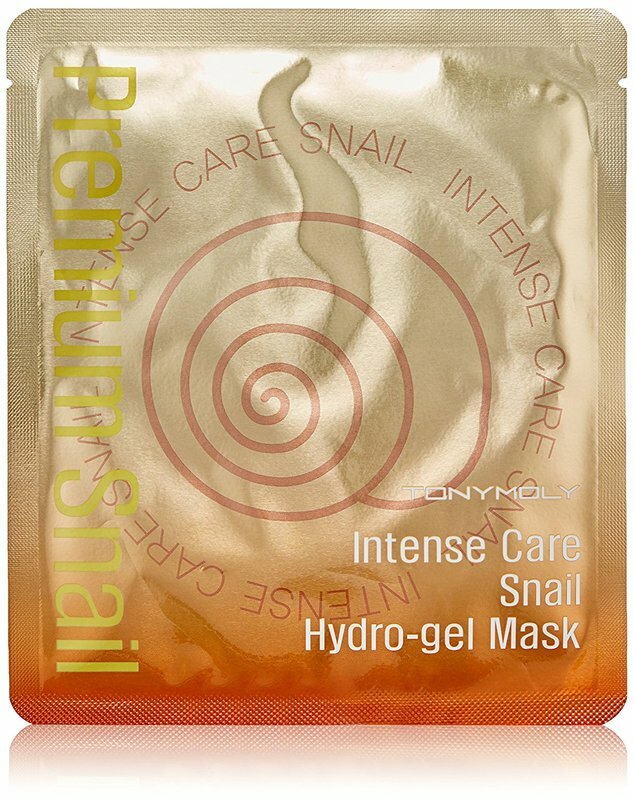 If you've read my earlier posts, you know that snail-based mask sheets are a huge trend right now and, even though it may sound gross, snail filtrate (the excretion that snails leave behind) is excellent for softening skin, at least from an anecdotal perspective. This snail mask contains 2,000 ppm. This is important! A lot of masks and cosmetic ingredients don't list how much snail filtrate they have in them. Your first clue is how high snail filtrate or snail secretion filtrate is listed in the ingredients (generally ingredients are listed from the largest amount to least amount). But when it's listed the ppm, or parts per million, then you know exactly how much snail filtrate you're getting in the product. It's tell you the mass of a chemical or ingredient per unit of water (also listed as milligrams per liter, mg/L). 5,000 ppm would be great, but 2,000 isn't bad. Overall, this mask is very pleasant and leaves the skin wonderfully soft the next morning. YAY OR NAY: Yay, for the best mask I've tested so far.